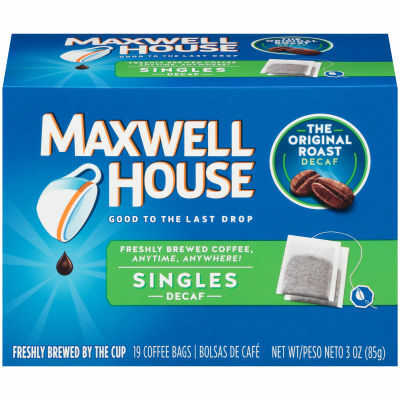 Decaf Coffee Bags - Maxwell House Singles Decaf Coffee Bags have a rich and delicious taste that strikes a delightful balance between acidity and body. Perfect as a wake-up drink with breakfast or a nightcap before bed, this delicious decaffeinated coffee has a warm, comforting taste you’re sure to love. Easy to Make - Give yourself the benefits of drinking coffee without the side effects of caffeine with Maxwell House Singles Decaf Coffee Bags. Offered in individually packaged bags to ensure freshness, this decaffeinated coffee has a rich, full-bodied flavor that you can enjoy anytime, anywhere.